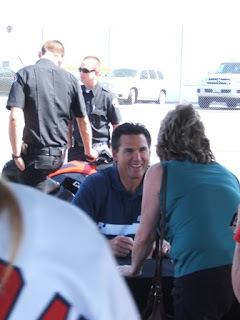 Had an opportunity to get several items signed by Angels franchise legend Tim Salmon when he was doing a promotional appearance at Angel Stadium for Can-Am Spyder - a roadster of sorts originating from Canada. Salmon is my favorite player and probably recognize him as the greatest Angel to put on the uniform as far as a guy who was drafted and developed in the organization - sorry to the more prominent and nationally recognized former Halos [i.e. a Nolan Ryan, a Reggie Jackson, a Rod Carew] who started their careers somewhere else. At his appearance, he made his way to do a meet-and-greet with the Spyder owners - before actually coming over to sign for the rest of the people who showed up to get his autograph. He was pleasant and took the time to take pictures with everyone who wanted one - as the line to get his autograph died down, I did overhear him say he probably could sign autographs all day long, but what got kind of tiresome was getting up from the table and posing for pictures. I think that tidbit was interesting to overhear, but I think he was just telling it like it was from his standpoint and didn't mean anything malicious. I'm looking for some 'new' cards to get autographed in-person and received a couple of minor league team sets I purchased from stb1 on EBay - it was a 2008 Cedar Rapids team set and a 2008 Clinton Lumberkings team set. Many of the players who played for those teams naturally advance one level up to their respective minor league teams in the California League - for Cedar Rapids players, they move up to Rancho Cucamonga [which essentially is my 40 minute away 'home team'] and for the Clinton Lumberkings players, they move up to the Bakersfield Blaze [which I see next month at Rancho]. I like minor league team sets but they are sort of outdated 'trading card relics' of yesteryear - meaning they are more novelty products these days rather than something you would hoard for value. I usually stick whatever Bowman/Tristar/Donruss/Just prospect cards I can get - however, the team sets give you the rank-and-file players and not just the top prospects. It seems like the 'top prospects' in these sets are afterthoughts because for someone like Derek Holland [who is already in the Major Leagues] alone - he already has a 2008 Bowman Draft Chrome first-year autograph card, along with some of the other 2008 first-year autograph cards produced by Donruss-Leaf-Playoff [and now Panini] i.e. Contenders. The Cedar Rapids set was in a 'loose' team bag of sorts with a haphazard placed MiLB logo - I don't know if it came packaged like this. Several of the top left corners on the first few cards were dinged with white corners. I'm not really going to compain but take note. The cards were arranged in numerical order, though I don't know if they came that way. The Clinton Lumberkings set was sealed in plastic with a haphazardly placed MiLB logo - the cards look like they are in better condition, though as the case with minor league cards, the card stock is really thin. These team sets often include the training staff and a novelty I've read about - is chasing down those individuals who have cards in these sets. They sets $11.95 each and I paid $30 cash [in the age of Paypal and even money orders, I feel like a luddite] - it came to around $14 per set when stb1 gave me back $2. While I don't have much experience with team sets, I always hear grumblings about how expensive they are either to buy from the teams themselves or through stb1 - I'd probably agree, though I like the novelty of having cards for players to sign, especially if they don't have Bowman/Tristar/Donruss/Just prospect cards out yet. Too bad Trevor Reckling got promoted already - I'll probably see him at the end of the year in Anaheim though, if he continues to pitch well. All of the people who are participating in this have a blog, or at least something similar. For this question, I just want to know about the reasons you do what you do. Why do you blog? What made you choose Sports Cards as your topic of choice? What got you started? What has been your favorite post from your own work? Collecting baseball cards/autographs are my last links to what I was doing when I was an adolescent through my teens - I never really stopped collecting, though like the blog, the interest ebbs and flows. I blog in order to show people I have an interest in collecting baseball cards and collecting autographs - at a time, when the reality is all I have are other blogs to read as opposed to real life interactions with actual collectors I might see on a regular basis. I don't have a cute banner, I don't have agenda against the card companies or known experts. I blog to showcase more stuff from my collection and talk about hobby related issues I may find interesting. My interests evolved from having a now-defunct through the mail autograph 'collecting' page 10 years ago - when people still had web pages instead of Web sites. In the last five years, it seems like every other collector has a blog instead of a Web page. My roots are in baseball card collecting and I liked the idea of someone being able to have fun with their cards - they randomly picked up at a card show or swap meet. I said if Ben Henry can have fun blogging about his baseball cards - then I can post a regular basis. Other 'fun sites' have influenced me through their postings include - the Cardboard Junkie, Dinged Corners, Wax Heaven, et al. My favorite posts probably come from the reflective posts - it adds some conscience to what I consider a site discussing the esoteric qualities of collecting baseball cards and autographs. i.e. Why we care about performance enhancing drugs. Angels catcher Jeff Mathis got the game-winning hit in a 5-4, 12 inning win - against the Boston Red Sox Thursday afternoon. It is nice when you can post something relevant to what is going on. He made an appearance to sign autographs at a telephone store in Tustin California last Saturday - I was able to get him sign two of the four cards I showed him. When I was in line, there was another collector infront of me - I don't know if he was making fun of me or my cards, but he had this smirk because the ones I had were prospect cards and/or MLBPA rookie card logo. It wasn't a big deal at all, just funny to see another true-to-life person make the distinction. Often times, people don't realize or care someone's first-year [non-minor league] card may have come out four or five years before - especially before the MLBPA rookie card rules came out. Even though the collector got an 8x10 photo signed - he had his box of Angels cards in-hand and had the 'real deal' xrc/rookie cards of Mathis [2001 Upper Prospects Premiere and 2001 Topps Traded]. Mathis was probably the No. 1 catching prospect in the Angels' system for the last four or five years in this decade - he is an athletic, competent receiver. While his bat has stagnated at times, he can probably produce offensively when given the at-bats to do so. I see Mathis as the type of hitter who keeps things going at the bottom of the lineup - stringing along hits here and there, with the ability to hit a home run once in a while. By virtue of them being catchers and playing in the Angels system through the 2000s - his best friend on the Angels is probably Mike Napoli. With how Napoli has developed in the minors and through the last few years in the Major Leagues - he probably Mathis' No. 1 competition at this point to be the Angels' starting catcher. Napoli's power and patience has translated to the point where Angels' Manager Mike Scioscia needs to get his bat in the starting lineup [as a catcher or designated hitter]. Pete Rose c/o Field of Dreams - I received the cards I sent to Rose signed in blue ballpoint pen after two weeks c/o the place he makes appearances at in Las Vegas. I wish he'd used a Sharpie - the autographs are tiny and the autograph on the 2008 Donruss Threads card is sort of smeared a little. It is a great success in my book - provided Rose signed the cards himself. It seems weird altogether, that a guy who almost always charges to sign autographs at organized signing events, would respond to requests to sign through the mail. Bill Schroeder c/o Milwaukee Brewers - Schroeder signed three of my cards in black Sharpie. The ink from autographs on the other cards stained the back of two cards, but there was one 'clean card,' from front and back. I mailed my request in mid April 2009 and got my cards back in about two weeks or so. Schroeder was a back-up catcher for the Brewers in the mid 1980s - and the California Angels just a few years at the start of the 1990s. I think he backed up starting catcher Lance Parrish. Schroeder is another retied former Angel autograph to add for my Angels project - Andy Hassler, Bo Jackson [on a golf tournament pairing book/program], Jerry Reuss, Schroeder and Bob McClure [a recent in-person success]. I'm sure I've got some autographs of guys I haven't bothered to 'count' just yet i.e. Matt Palmer [2009 rookie, who I got this past spring training] and Rafael Rodriguez [2009 rookie, who I got in spring training the year before this one] - a lot of fun is discovering you already have autographs of Angels players who are rookies or players who end up becoming Angels through various transactions. At his healthiest during the mid to late 1990s, Gonzalez was an RBI machine - all the ribbies he got may have been the result of guys hitting infront of him and getting on-base, but there is no denying the man could rake. I remember being so excited to get his and Ivan Rodriguez's autograph on cards 10 years ago after getting into a baseball stadium before the gates were scheduled to open - Gonzalez actually was a pretty good signer if you saw him and I think even have a picture with him. Of course things went sort of downhill for Gonzalez when he turned down something like $140 million over 10 years from the Detroit Tigers in 2000 - he had a great season with the Cleveland Indians in 2001, but various bumps and bruises presumably ended his Major League career a few years later [he tried to make a comeback with the St. Louis Cardinals in the spring of 2008, but pulled up lame]. Gonzalez is probably a borderline Hall of Famer but possible red flags in his prolific Major League Baseball career [during the Steroids Era] - include being associated with noted [or infamous] Dominican Republic trainer Angel Presinal and also with good ole' Jose Canseco who implicates Gonzalez [among other prominent, early 1990s Texas Rangers' players] of PED use in Canseco's first book [Juiced]. Nate Schierholtz c/o San Francisco Giants - I mailed this request [consisting of two cards] out near the beginning of the 2009 season and received it back in May. Schierholtz signed two cards in blue ink. Though he was never listed as the top prospect in the Giants' system by Baseball America, I think Schierholtz was considered the organization's best position player coming up through the minor leagues for several seasons. With the ability he has shown and his age - he probably needs the opportunity to play everyday as opposed to getting random at-bats and/or random starts here and there. Manny Ramirez was suspended 50 games for using a fertility drug - supposedly used to stimulate testosterone production. I think if you are considered a superstar through your mid to late 30s - you should get the jock deity treatment and take all the stuff you need to perform one, two or three more years. It maybe a radical opinion - but I don't care about the performance enhancing drug use of guys like A-Fraud, Manny, Roger, Barry, Mark or any of the main 'other' guys implicated through this decade. I know the established superstars are good for it and they are who I pay to watch the game - if I'm seemingly ambivalent over PED use or oversimplifying, then so be it. It becomes a witch hunt anyway and I wonder if we'll ever get to some understanding it was an implicit part of the game - the terrain is murky however and the moral dilemmas shift from one way to the other. I believe some guys dabbled here, dabbled there and maybe some guys have used them for a prolonged period of time - during the last 25 years PED use has exploded to fuel bigger, faster and better players. It doesn't make it OK, but how can we get angry and pass judgment when PED use was so prevalent - admittedly however, it is harder to watch the game as a spectator and judge numbers from the Steroid Era. I can choose to enjoy the Major League game and be a staunch defender - as someone who is a little ignorant, naive or blind. You watch one guy, nicknamed 'The Machine' in St. Louis and he's the next guy at the top of the hill, the shining beacon of hope in our downtrodden times - Albert Pujols is truly the best player in the game today, but is he clean? Has he always been clean? How did he get to where he is? Playing in the Steroid Era, will he be the next one exposed? I can be totally disgusted, knowing the players you may love to watch are damaged goods and no one is above suspicion - from the slap hitting dynamo to the bruising slugger who either hits a home run, walks or strikes out. Part of me says 'get a grip' because this is the real deal in professional sports and whether I like it or not - players are looking for an edge, even to cheat to justify their livelihoods. You either pay to watch them play, tune in somewhere to watch them, chase them for autographs or you do something else entirely. Part of me says, what about the legacy, what about the history of the game that presents itself as a noble game, with noble heroes - while the history of Major League Baseball is flawed, there is a fine line painted between what certain players in bygone eras represented and what players of today do. By using PEDs, it seems like the players are content to give the finger to the past. Where is the professionalism - don't cheat your way to the top, don't try and get an edge by using PEDs. Let your talent take you as far as you can go and if you aren't good enough or can't play long enough, go somewhere and play golf. Maybe I've been influenced by a Goose Gossage interview during a 6-1 Angels win on Thursday night - the Goose said if a player is caught using PEDs, the teams should void their contracts. Gossage doesn't like Manny, doesn't like 'my man' Francisco K-Rod Rodriguez showboating [after his saves], doesn't like Joba Chamberlain's fist pumps [Gossage said he was contacted by the general manager of the Yankees after Gossage was interviewed about Chamberlain]. Gossage thinks the 'me first' baseball players have ruined the game because they don't carry themselves with the same respect some of the past greats had when they were playing - as sort of a link between the past, present and the future. Gossage firmly states that no one player is bigger than the game. It is kind of sad, Jose Canseco was right again - not that I have anything against Canseco, just that what he has said has been the truth. Once he said Manny might be using, you couldn't just brush it off and was waiting for 'El Maniaco' to be exposed one way or the other. If he throws the name out of your favorite player as a potential PED user/abuser - you'd better be listening. The games go on, but I don't know how to feel about guys who maybe real good at playing this game and their lasting legacy - because they might have artificially inflated their numbers. While Jerry Reuss was a little bit before my time - he was a solid performer, who won 220 games in the Major Leagues and was a two-time all-star. He made an appearance to sign autographs at a minor league baseball game in Rancho Cucamonga California last Sunday - I needed to get his autograph for my ongoing Angels' autograph collection. He played for the Angels in 1987 and posted a 4-5 won-loss record and a 5.25 ERA. 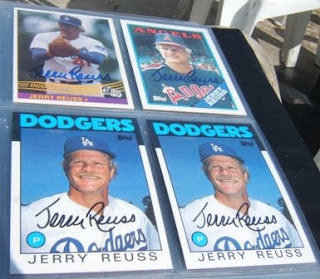 I only had the 1984 Donruss in-hand - I offered to get a couple of cards signed for an acquaintance I sometimes see getting autographs, if I got one card picturing Reuss as a Halo. Reuss ended up signed three cards on a clipboard [one for me, two for the acquaintance with his Angels card going to me] - I had maybe two or three other cards with me [again for the acquaintance] and while Reuss saw them [I didn't put them on the clipboard], he said I'd have to get back in line to get them signed. I gave the cards [one signed, two unsigned] back to the acquaintance but got back in line because Reuss had a stack of 1986 Topps cards he was signing if you didn't have anything to get signed by him - I got two of those cards, though I didn't bother to ask him to sign it with a specific color Sharpie this time. I think Reuss was cordial, though maybe a little reserved - he was accomodating, signing from the start of the game [2 p.m.] to about 4 p.m.
After a horrible loss by the Angels on Friday night, the Angels defeated the New York Yankees 8-4 - Matt Palmer was the Halo star on the mound as he pitched 6 1/3 innings, allowing only three hits and one run against the New York Yankees. I'm not going to say I knew much about Palmer - other than a random guy whose autograph I got in spring training. He seemed accomodating and friendly. One of the fun things about collecting autographs - is getting one of someone who maybe in the minor leagues, who may not be nowhere close to being a prominent member of your 'home town' team, but who contributes later on. It is some credit to the Angels' organization - they find a guy like Palmer or Shane Loux and give them a legitimate opportunity to contribute. One of the great qualities of manager Mike Scioscia is the ability to find use out of the last guys on the 25-man roster. If you are called up, you aren't merely there to fill up a roster spot. On the other end of the spectrum - I would believe every other Angels fan is bitching about perennial top prospect Brandon Wood playing. No one even matters because he is the next great, hype yet to be realized. When was the last time the Angels had someone like Wood? When Todd Greene was coming up? When Troy Glaus was coming up? When Darin Erstad was coming up? When Jim Edmonds or Tim Salmon was coming up? Now, Wood is 24 years old and who can ever think being 24 is somehow a step away from not making it in any profession - the young man does need to play in order to see if he is an all-star talent or is going to disappoint. I'd like to say Wood isn't the uber prospect anymore destined to be a superstar - I tend to believe if Wood had a career path similar to Evan Longoria, David Wright or Ryan Braun type, he should be in second or third full season in the Major Leagues already. However - it just seems like he has made some strides to fix some holes in his swing and he does have legitimate 30 home run power. As much as the Angels put faith in 30-year old journeymen, they need to do so in a guy who still can be a franchise player for the next five or six years. 1.) Bullpen implosion - I was hoping Brian Fuentes would give the Angels a different look out of the bullpen, but I want K-Rod back. It seems like the 2009 group has been one big fail. 2.) Wanting to dump Erick Aybar - his nickname is 'Failbar' on a fan site I visit, though I don't get the impatience other than he is a little, speedy, punch-and-judy type of hitter who sometimes gets careless on defense. 3.) Pitching staff - have holes like Swiss cheese, but Ervin Santana and John Lackey look to make some rehab starts next week. 4.) Gary Matthews Jr. - this guy didn't come cheap a few years ago, this guy then got implicated for purchasing HGH and was demoted to being a fifth outfielder before the 2009 season started. As is however, he has the opportunity to show he can still perform on a regular basis. 5.) Loss of Nick Adenhart, Courtney Stewart and Henry Pearson - I really cannot forget what happened as we try to move on while Jon Wilhite [the lone survivor of the crash] continues to struggle in fair condition. I'm way late to the party, but found this trading card image from a message board and with the new A-Rod revelations, found it apropos. My only question is whether or not the actual image was Photoshopped.